Try before you buy is the best idea. My mother got really carried away with this years ago. One rental weekend later and campervans were never mentioned again. Not saying you will be the same but it may save you some cash and good advice on here from people! Good luck, maybe wait for the weather to not be so nuts too! It's not me that's that up for it. I really don't want the hassle of another vehicle to look after. I think the romance will wear off after a while too. How long the novelty factor would last I don't know. I'm trying to discourage her. Half the reason she want one is so we can take our old dog with us on breaks and for us at festivals. Most of the places that hire don't permit dogs. The vans they hire out will also be considerably better than what we are looking. Also the insurance policies on the hire vans is usually quite scary with lots of very big exclusions. Many forms of the most common accident are excluded. One I read the other week said that in the event of fire or theft the hirer was liable for 25% of the total cost of the claim. Bunk Campers rent out VW campers, have a base in Scotland or CaliforniaScotland. I've got a T5 camper from Bodans, so a half decent convertor..ie.using proper bits Like Reimo Pop Top Roof, RIB rock and Roll, Propex heater etc. You should get a good one for £20K, say 10 year old. It works well for us as a family of 4, and we've done about 65 night away in it so far in the 18 months of ownership. Which considering we both work and the kids are young but at school ain't too bad. Its got us out much more and we've stayed and been to some fantastic sites/festivals and short breaks. Last edited by robertdon777; 24-07-2018 at 02:24 PM. We had one for 3 years, and sold it last year. Cost £5 in depreciation. It was brilliant, had a separate shower, toilet at the rear, good kitchen and flexible sleeping arrangement. As a two berth it was not compromised with dodgy bunks or space in the (too hot) roof. We had great trips all over the UK in it, and cost peanuts to run. 25mpg and an annual service. I found it very easy to drive and manoeuvre as the width is the same as a white van and the wheelbase was decent with not too much overhang. Here's a very similar one to ours (after Autocruise were taken over the later ones were much lower quality). One small detail that isn't shown on the pictures is that with the door to the toilet/shower open when you're driving, you can see out of the rear window with your driving mirror, as well as the wing mirrors. A lot of campers have solid panels. Noticed you also have a dog - ours wouldn't let us go anywhere in the campervan without her, unlike the cars she refuses to get into! Last edited by plw; 24-07-2018 at 04:16 PM. How about something smaller ? Or these if you want to try ? Last edited by SteveTDCi; 24-07-2018 at 07:19 PM. That rental company has better insurance terms. Just a £500 excess, £500 bond and the windscreen, tyres and wheels to pay for if damaged. The Caddy is too small. Last edited by Kerr; 24-07-2018 at 08:05 PM. 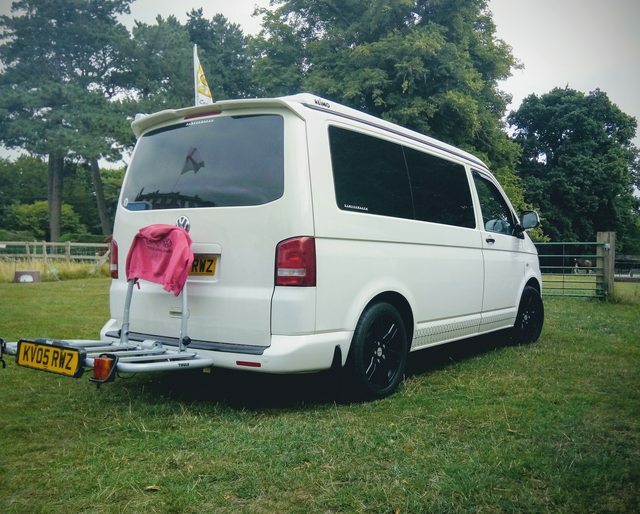 I've no idea on camper vans or caravans and neither me or my wife have ever had the desire to get one, but unless you are both on board with this idea I can see only see it leading to failure. Kerr, if you do end up getting one, it may just lead to resentment and arguments, something which nobody wants. It seems from what you've said so far that this is all one-sided. Sorry, just saying it like it seems to me. If you decide to go ahead, there has been some good advice here to at least have a trial before biting the bullet. You may both love it, or equally both hate it. Worse though if one is set on it and the other isn't - at least you'll have something to work with though. Good luck.